Moroccan Air Force Royal Maroc Patches Squadron Crest Tac Ops Detachments Commemorative Patches. 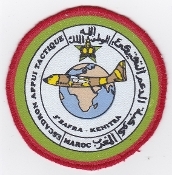 Morrocan Air Force Patch Royal Maroc Escadron Appui Tactique Tactical Transport Squadron C 130 Hercules Patch Badge 3 BAFRA Kenitra 1970s Printed on twill cut edge 91mm three and five eighth inches diameter. More Moroccan Air Force Royal Maroc patches flying suit badges coming soon.